UNIQUE Custom Pools continues to be an industry leader by creating many spectacular Arizona architectural style swimming pools and spas for our Phoenix clients. Generally referred to as Architectural Pool & Spa Design, this method of swimming pool design involves beginning with very geometric, clean and straight lines when configuring the pools basic shape. UNIQUE’S architectural pools generally encompass long rectangular lap pools, traditional clean-line pools, and square or geometric pools. It is critical that homeowners select a pool and spa design professional who understands all of the aspects of this pool design style and is also able to seamlessly integrate the architectural style throughout the landscape and outdoor living design as well. UNIQUE specializes in all aspects of architectural pool construction, and we understand the meticulous details required to create every clean-line pool. Tile and edge work must be accurate to within fractions of an inch. Patios must line up perfectly with the house and walls. Without this extreme attention to detail, even just slight variations become glaringly obvious error in design, construction or both. 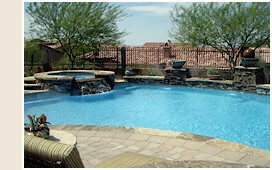 All UNIQUE Phoenix pool and spa designs start with some type of architectural detail and develop into a custom Arizona architectural swimming pool. The perfect complement to any architectural style pool and spa is the addition of a sheer descent waterfall, custom water wall, stone column or square wok pot. Some of the most intriguing projects in the valley include integrated UNIQUE swimming pool design and the landscape design, providing UNIQUE customers with a seamless transition from the pool and spa to the landscape and outdoor living areas.